Novak Djokovic, of Serbia, kisses the championship trophy after defeating Roger Federer, of Switzerland, during the men's championship match of the U.S. Open tennis tournament in New York. 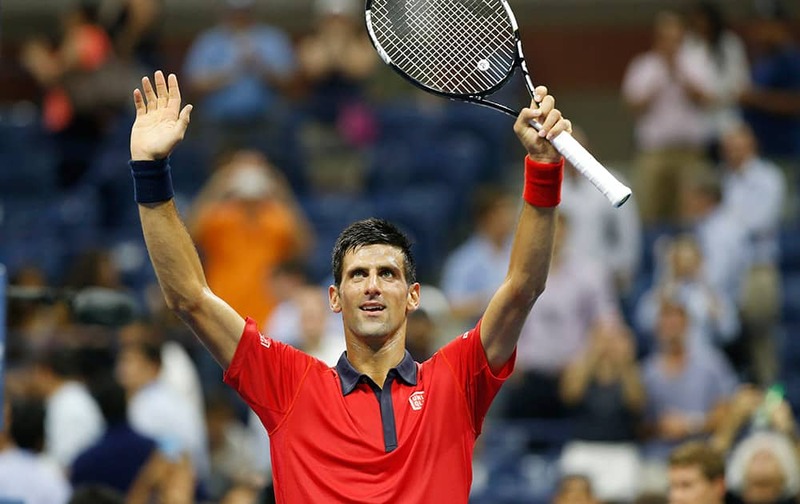 Novak Djokovic, of Serbia, is thronged by supporters after beating Roger Federer, of Switzerland, in the men's championship match of the U.S. Open tennis tournament in New York. Flavia Pennetta, of Italy, holds the U.S. Open tennis women's singles championship trophy during a visit to the Top of the Rock Observation Deck at Rockefeller Center in New York. 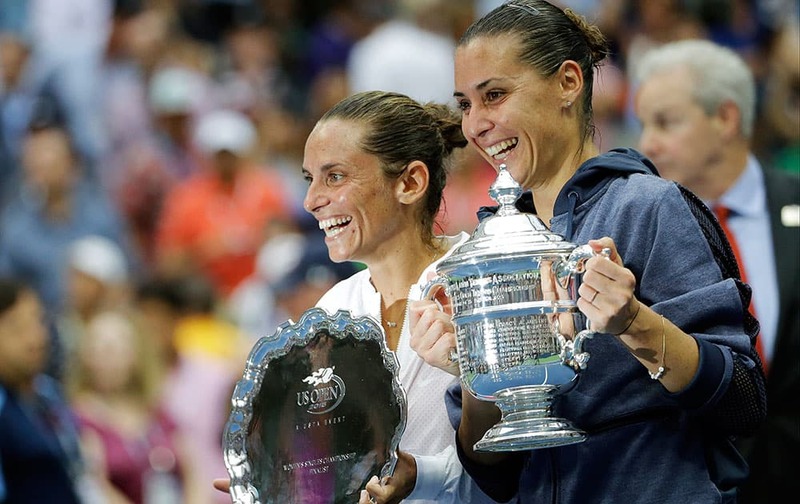 Roberta Vinci, of Italy and Flavia Pennetta, of Italy, pose for photos after Pennetta beat Vinci in the women's championship match of the U.S. Open tennis tournament. 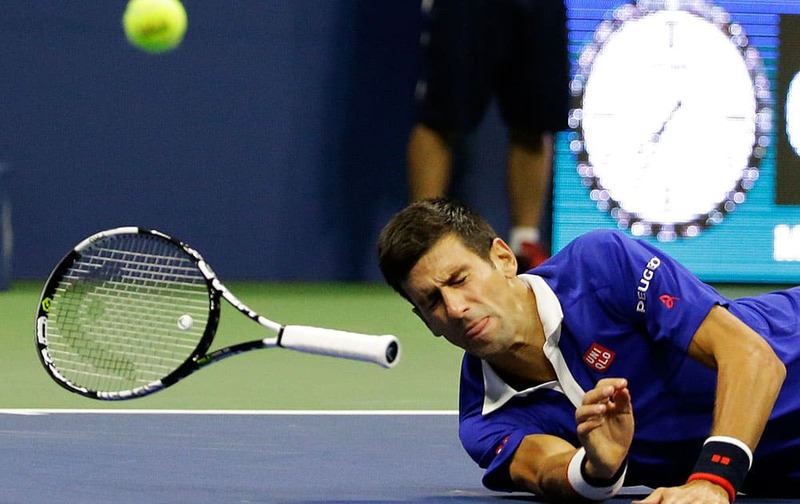 Novak Djokovic, of Serbia, falls to the court while trying to return a shot to Roger Federer, of Switzerland, during the men's championship match of the U.S. Open tennis tournament. 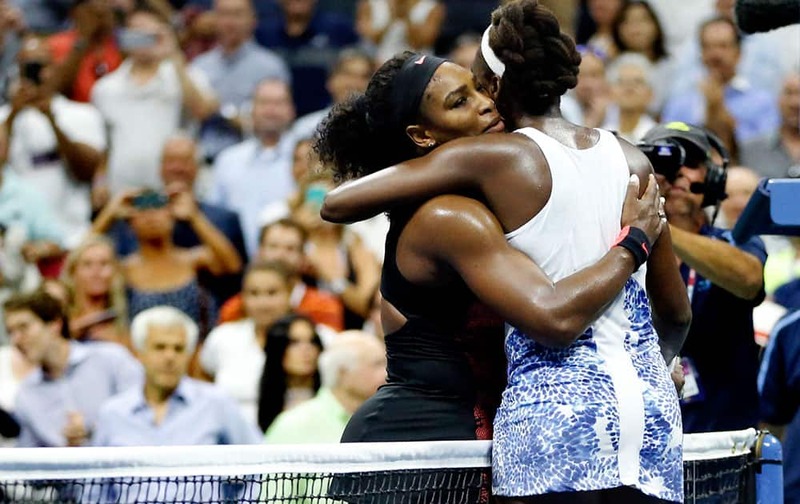 Serena Williams hugs Venus Williams after winning their quarterfinal match at the U.S. Open tennis tournament. 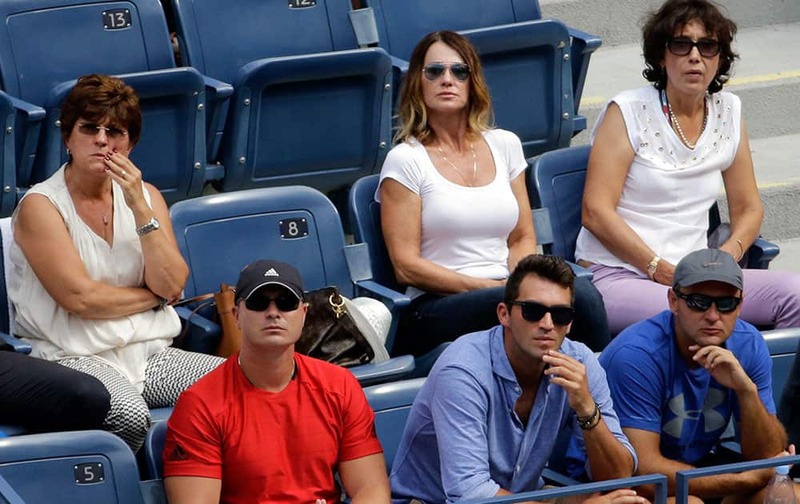 Olympic gymnast Nadia Comaneci watches a quarterfinal match between Victoria Azarenka, of Belarus, and Simona Halep, of Romania, at the U.S. Open tennis tournament. Roger Federer, of Switzerland, reacts after beating Richard Gasquet, of France, during a quarterfinal match at the U.S. Open tennis tournament. 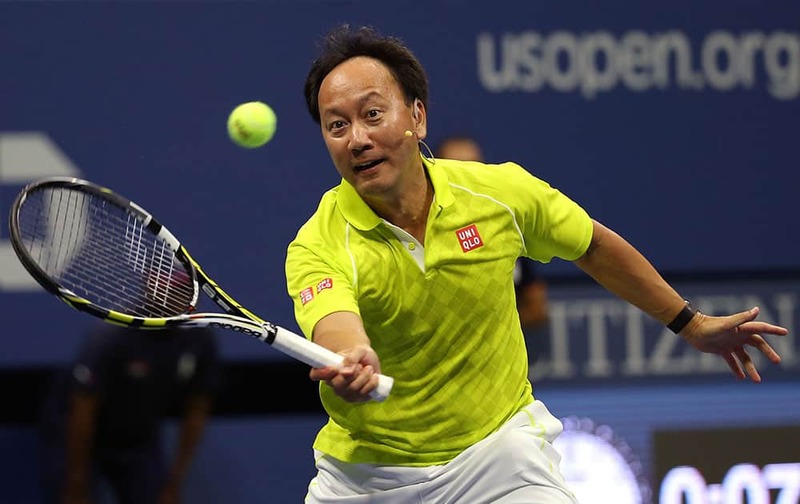 Michael Chang returns a shot to Jim Courier and Mardy Fish during an exhibition doubles match, with Chang teaming with John McEnroe, at the U.S. Open tennis tournament. 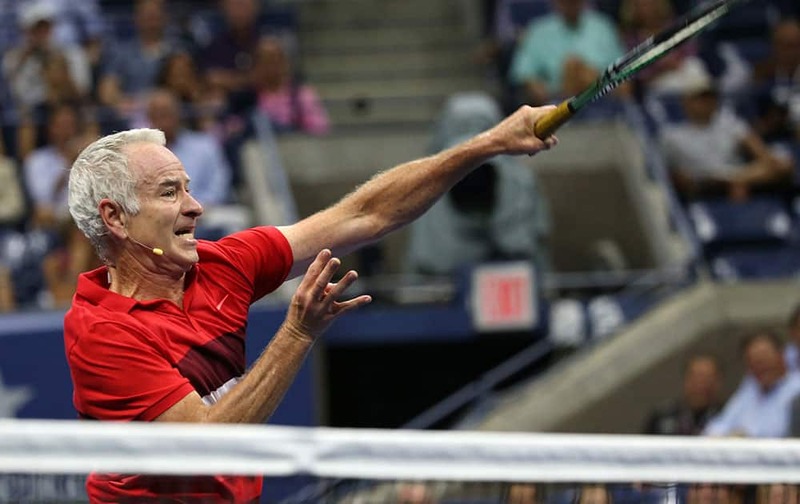 John McEnroe returns a shot as he and Michael Change play Jim Courier and Mardy Fish during an exhibition doubles match at the U.S. Open tennis tournament. Novak Djokovic, of Serbia, returns a shot to Feliciano Lopez, of Spain, during the quarterfinal round of the US Open tennis tournament. 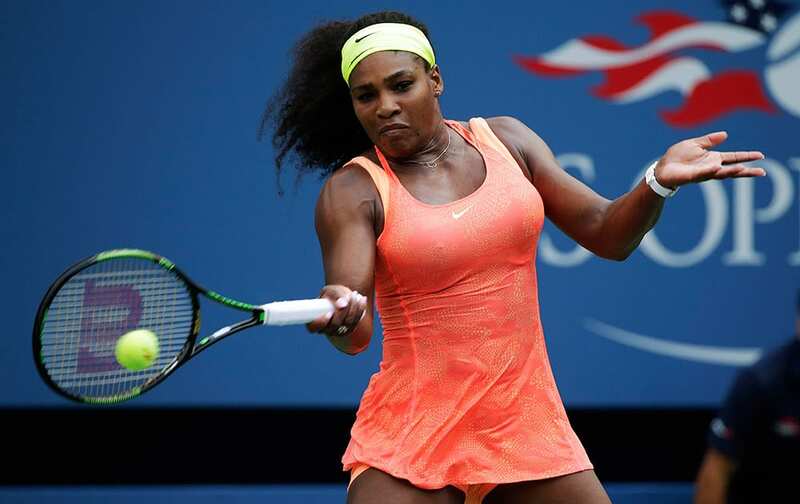 Serena Williams returns a shot to Venus Williams during a quarterfinal match at the US Open tennis tournament. 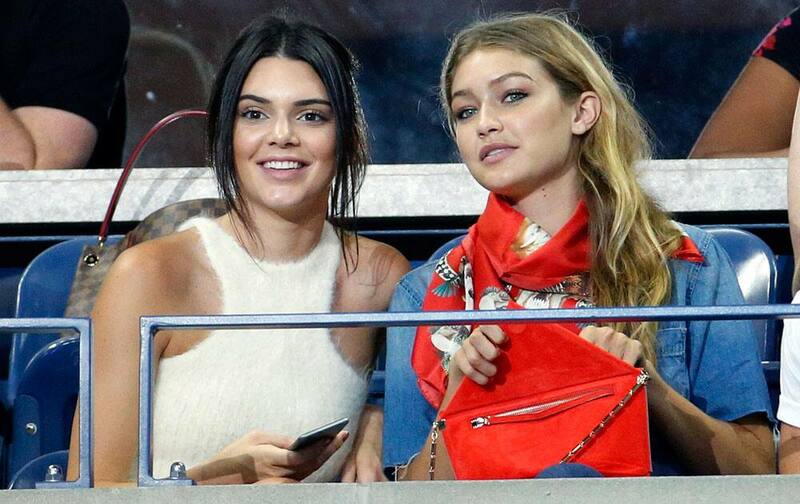 Kendall Jenner and model Gigi Hadi prepare to watch a quarterfinal match between Serena Williams and Venus Williams at the US Open tennis tournament. Petra Kvitova, of the Czech Republic, returns the ball to Johanna Konta, of Britain, during their fourth-round match at the US Open tennis tournament in New York. 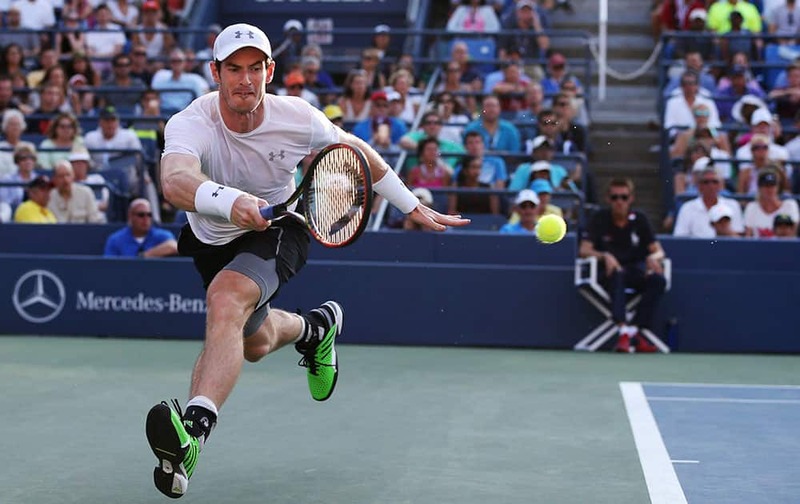 Andy Murray, of the United Kingdom, returns a shot to Kevin Anderson, of South Africa, during the fourth round of the US Open tennis tournament. 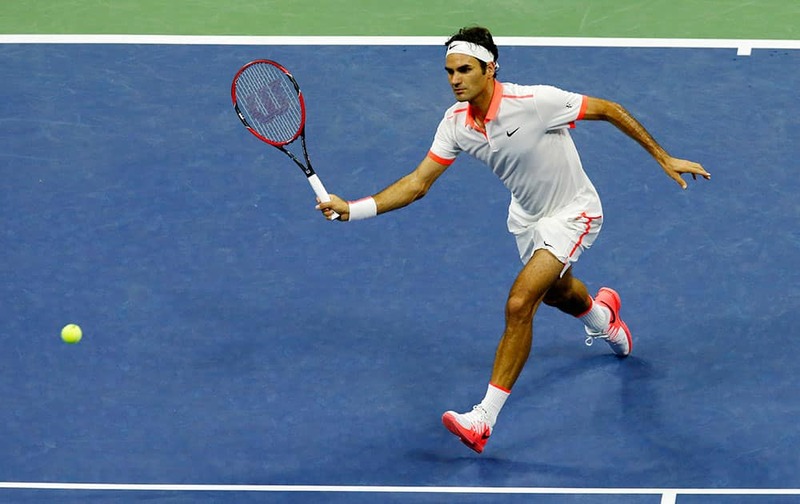 Roger Federer, of Switzerland, returns the ball during his fourth round match against John Isner at the US Open tennis tournament in New York. Kristina Mladenovic, of France, serves to Ekaterina Makarova, of Russia, during the fourth round of the U.S. Open tennis tournament. 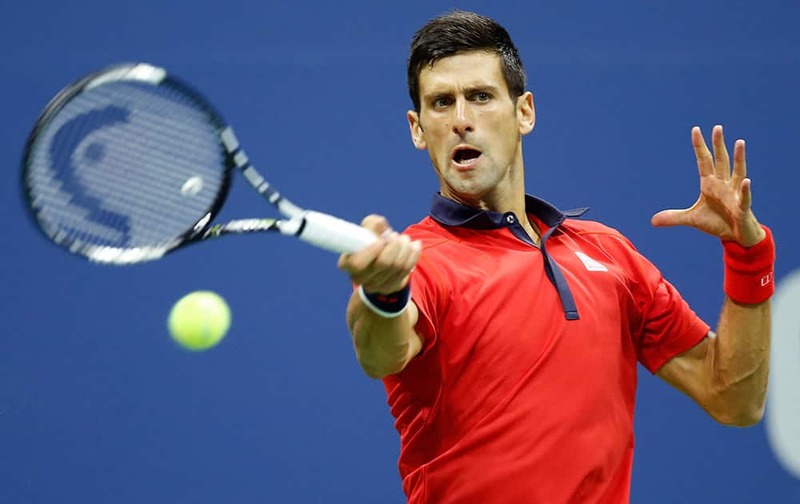 Novak Djokovic, of Serbia, returns the ball during his fourth round match against Roberto Bautista Agut, of Spain, at the U.S. Open tennis tournament in New York. 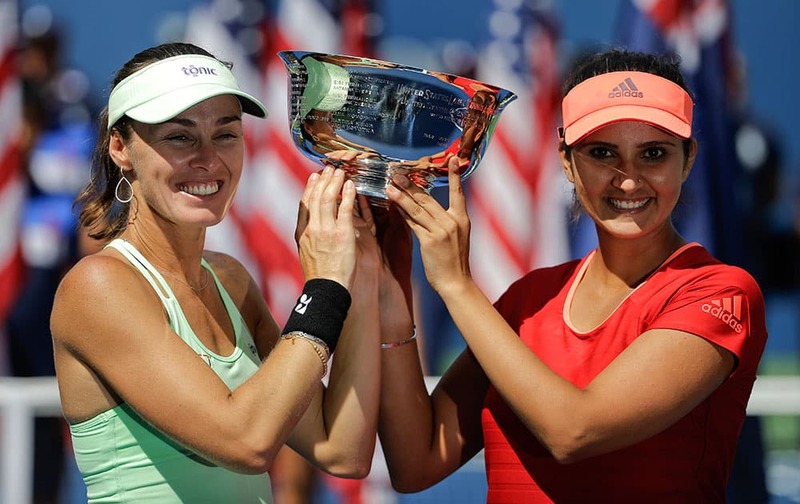 Martina Hingis of Switzerland and partner Sania Mirza, of India, celebrate after winning their doubles match during the fourth round of the U.S. Open tennis tournament. Serena Williams, of the United States, kneels on the court during her match with Madison Keys, of the United States, during the fourth round of the U.S. Open tennis tournament. Sabine Lisicki, of Germany, serves to Camila Giorgi, of Italy, during the second round of the U.S. Open tennis tournament. Petra Cetkovska, of the Czech Republic, reacts after taking a point from Caroline Wozniacki, of Denmark, during the second round of the U.S. Open tennis tournament in New York. Cetkovska won 6-4, 5-7, 7-6 (1). 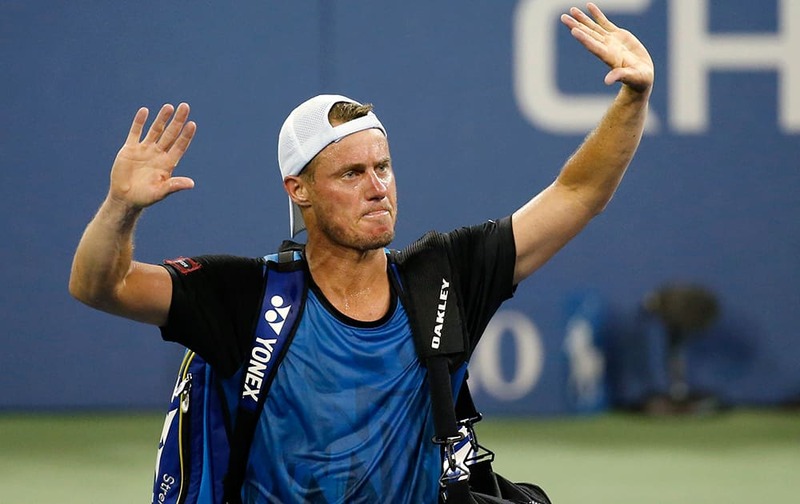 Lleyton Hewitt, of Australia, bids farewell to the crowd after losing to countryman Bernard Tomic, 6-3, 6-2, 3-6, 5-7, 7-5, during the second round of the U.S. Open tennis tournament in New York. 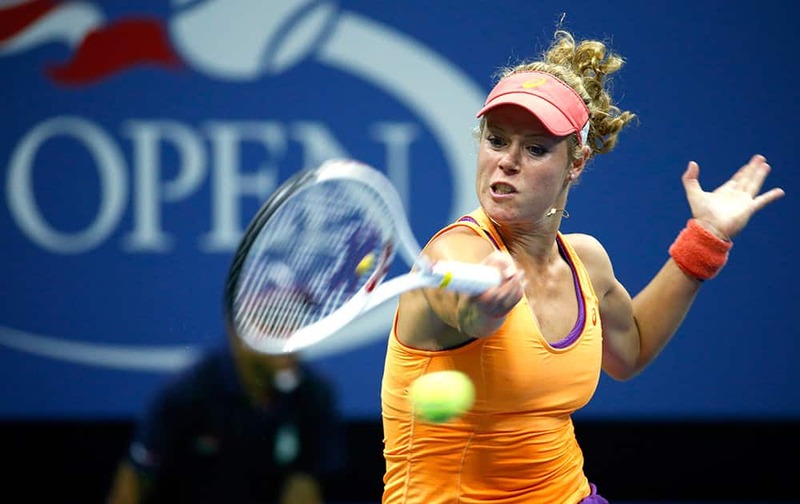 Caroline Wozniacki, of Denmark, returns a shot to Petra Cetkovska, of the Czech Republic, during the second round of the U.S. Open tennis tournament in New York. Roger Federer, of Switzerland, towels off between sets against Steve Darcis, of Belgium, during the second round of the U.S. Open tennis tournament in New York. 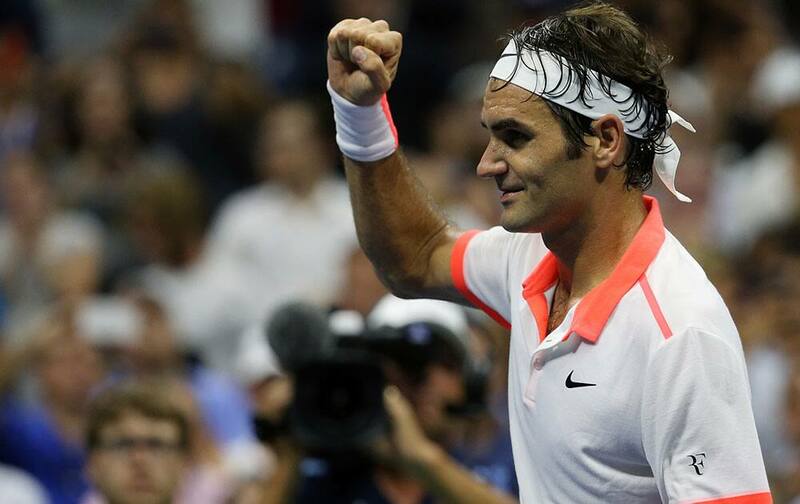 Federer won 6-1, 6-2, 6-1. 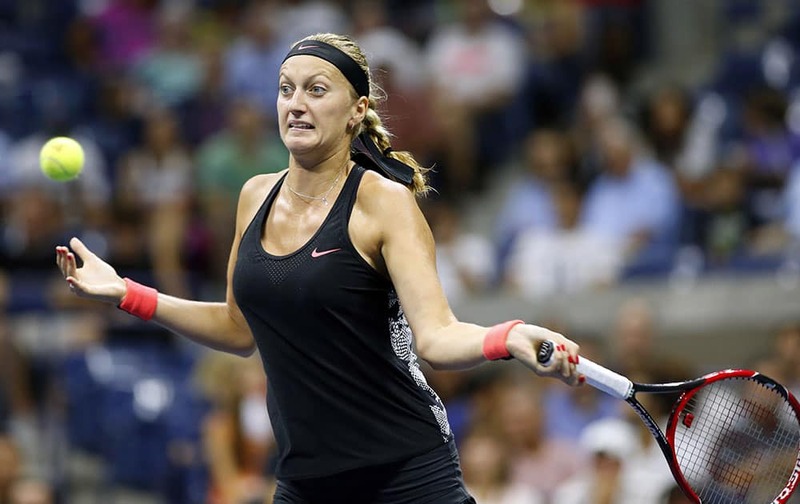 Petra Kvitova, of the Czech Republic, returns a shot to Nicole Gibbs, of the United States, during the second round of the U.S. Open tennis tournament. Angelique Kerber, of Germany, lunges to return a serve from Karin Knapp, of Italy, during the second round of the U.S. Open tennis tournament. Victoria Azarenka, of Belarus, reacts after a point against Yanina Wickmayer, of Belgium, during the second round of the U.S. Open tennis tournament. Novak Djokovic, of Serbia, waves to the crowd after defeating Andreas Haider-Maurer, of Austria, 6-4, 6-1, 6-2, in the US Open tennis tournament in New York. Lauren Davis, of the United Sates, hits a forehand to Ekaterina Makarova, of Russia, during the second round of the US Open tennis tournament in New York. 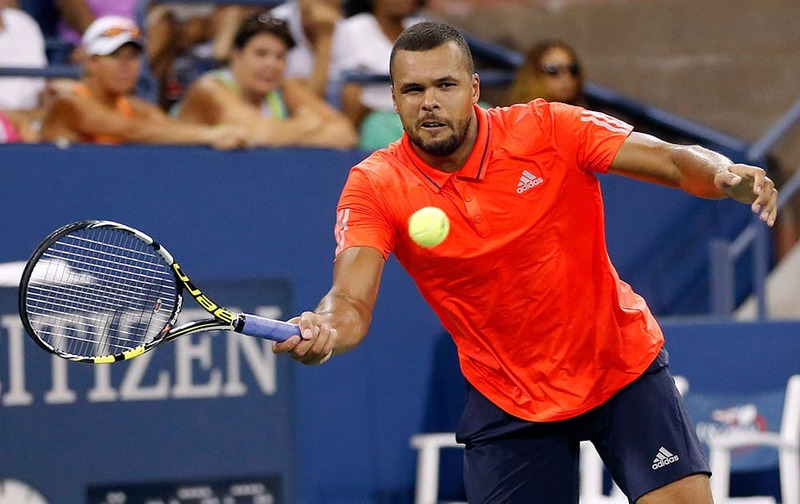 Jo-Wilfried Tsonga, of France, hits a forehand to Marcel Granollers, of Spain, during the second round of the US Open tennis tournament in New York. Rafael Nadal, of Spain, reacts after beating Diego Schwartzman, of Argentina, during the second round of the US Open tennis tournament. Eugenie Bouchard, of Canada, returns a shot to Polona Hercog, of Slovenia, during the second round of the US Open tennis tournament. 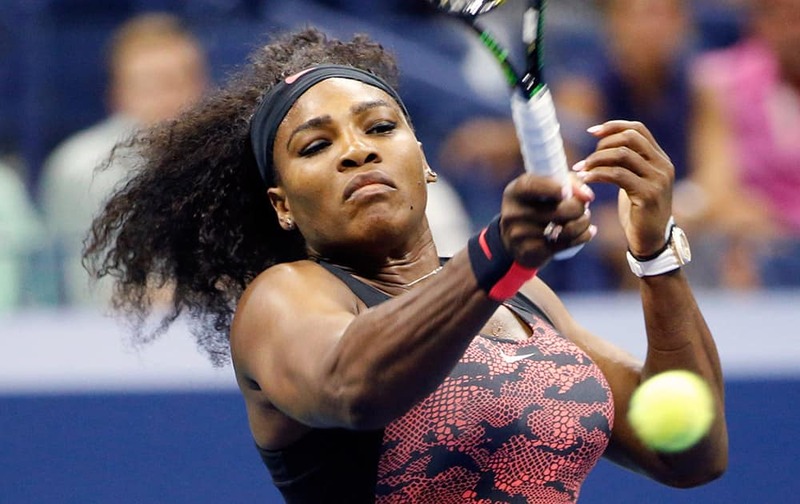 Serena Williams returns a shot to Kiki Bertens, of the Netherlands, during the second round of the US Open tennis tournament. 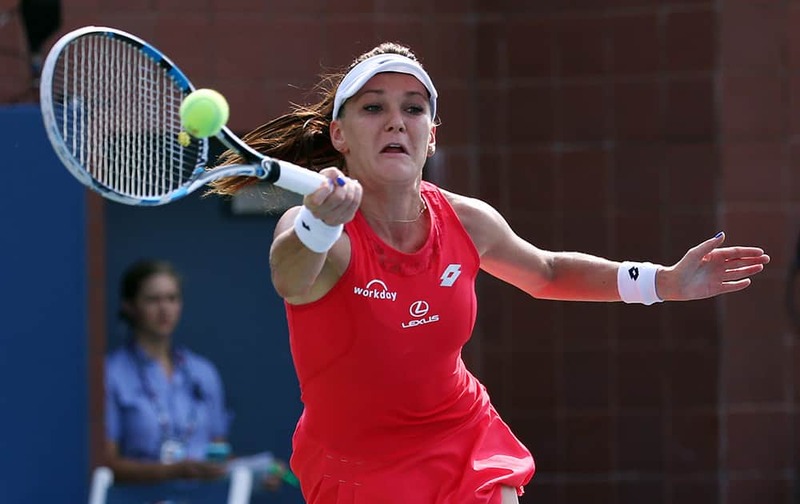 Agnieszka Radwanska, of Poland, returns a shot to Magda Linette, of Poland, during the second round of the US Open tennis tournament. Laura Siegemund, of Germany, returns a shot to Petra Kvitova, of the Czech Republic, during the first round of the US Open tennis tournament in New York. Petra Kvitova, of the Czech Republic, returns a shot to Laura Siegemund, of Germany, during the first round of the US Open tennis tournament in New York. 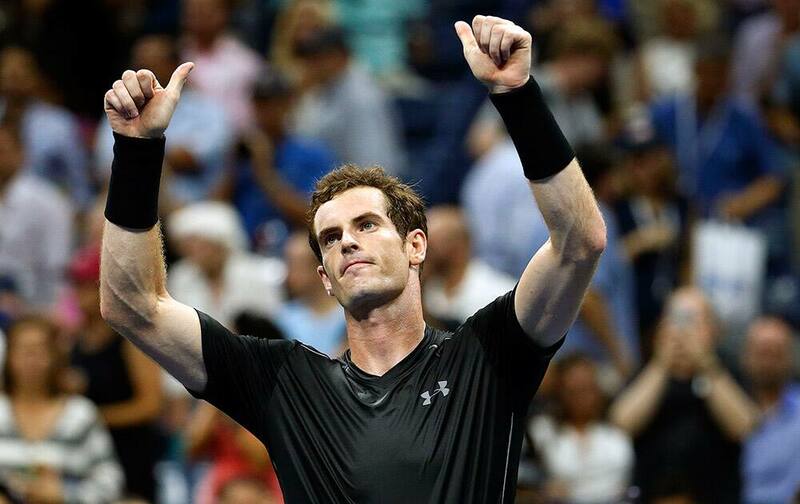 Andy Murray, of Britain, reacts after beating Nick Kyrgios, of Australia, during the first round of the US Open tennis tournament in New York. 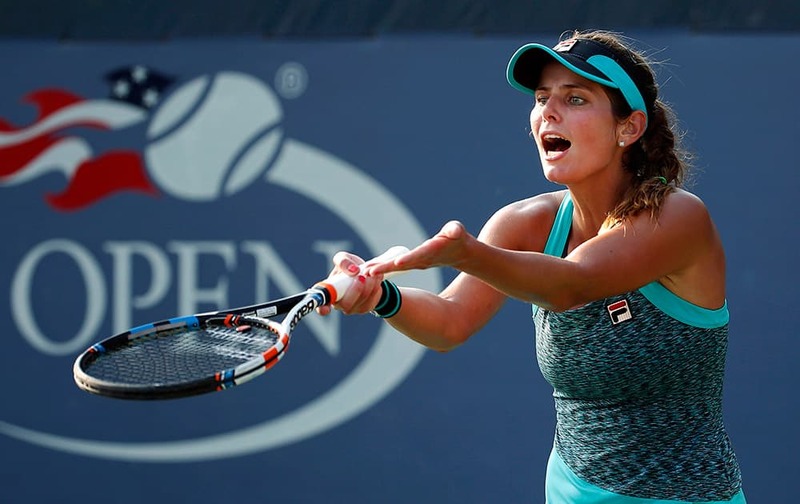 Julia Goerges, of Germany, argues a call in her match against Anna Schmiedlova, of Slovakia, during the first round of the US Open tennis tournament. Lucie Safarova, of the Czech Republic, returns a shot to Lesia Tsurenko, of Ukraine, during the first round of the US Open tennis tournament. 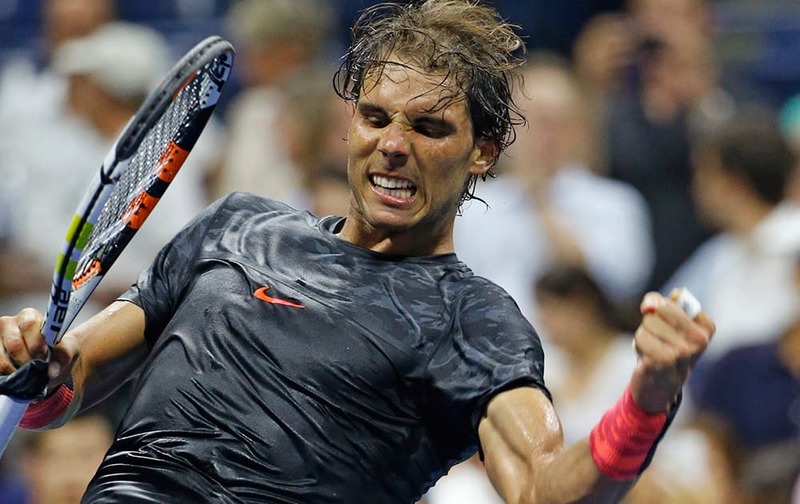 Rafael Nadal, of Spain, reacts after defeating Borna Coric, of Croatia, in the first round of the US Open Tennis tournament in New York. 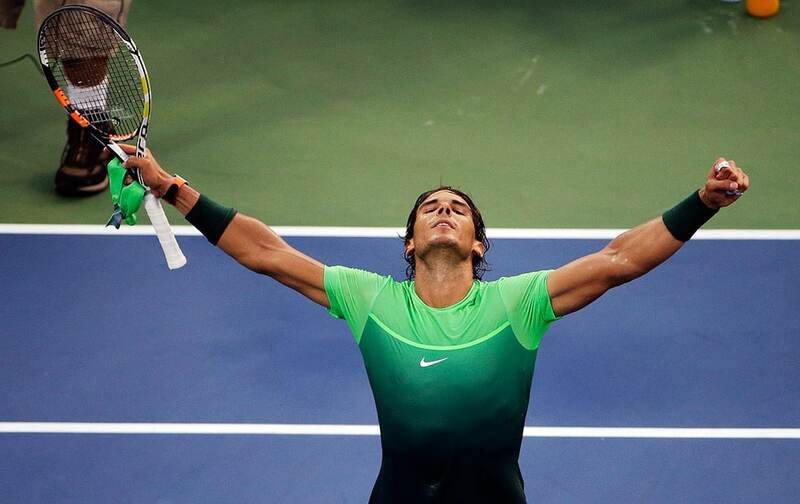 Nadal won 6-3, 6-2, 4-6, 6-4. Madison Keys gestures after a shot to Klara Koukalova, of the Czech Republic, during the first round of the US Open Tennis tournament in New York. 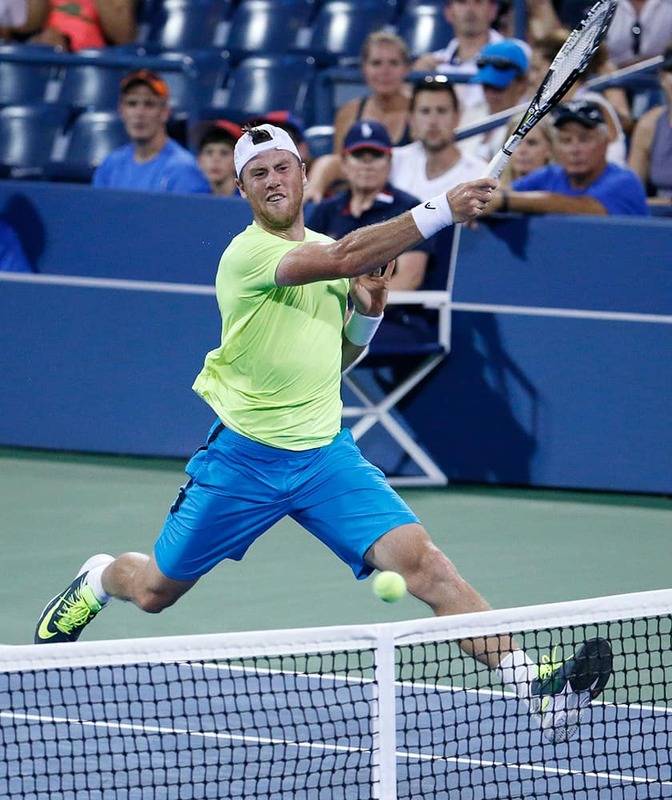 Illya Marchenko, of Ukraine, returns a shot to Gael Monfils, of France, during the first round of the US Open Tennis tournament in New York. 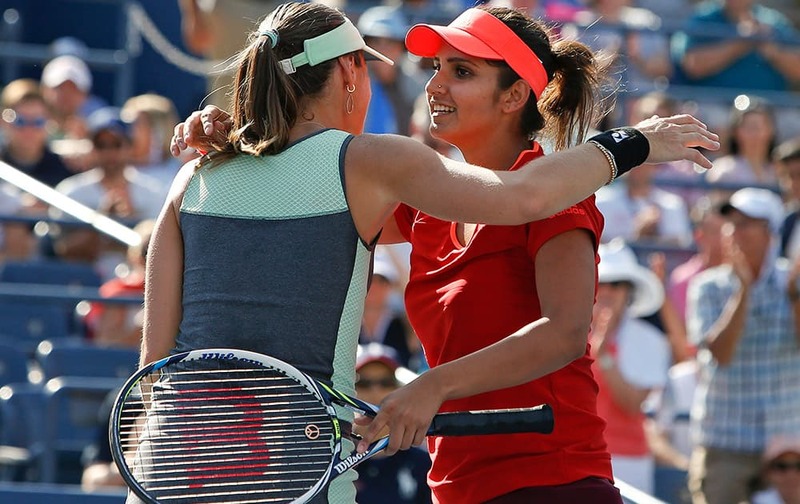 A trainer tends to Vitalia Diatchenko of Russia during her first round match against Serena Williams at the US Open Tennis tournament in New York. 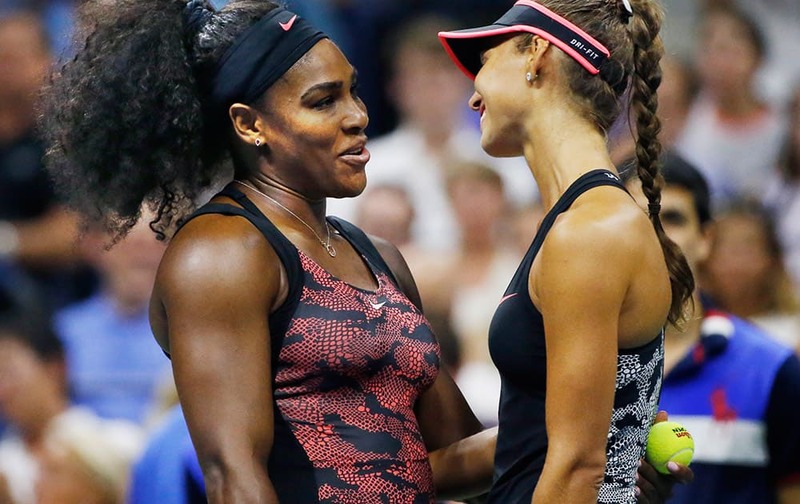 US Open defending champion Serena Williams consoles opponent Vitalia Diatchenko of Russia after Diatchnko stopped playing because of an injury during her first round match against Williams at the US Open Tennis tournament in New York. 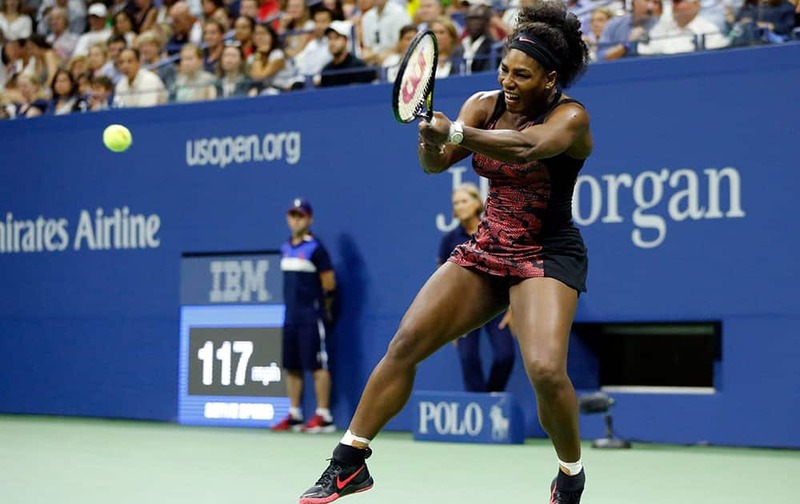 US Open defending champion Serena Williams of the United States returns the ball during her first round match against Vitalia Diatchenko of Russia in the US Open Tennis tournament in New York. Coco Vandeweghe, of the United States, reacts after beating Sloane Stephens, of the United States, during the first round of the US Open tennis tournament. 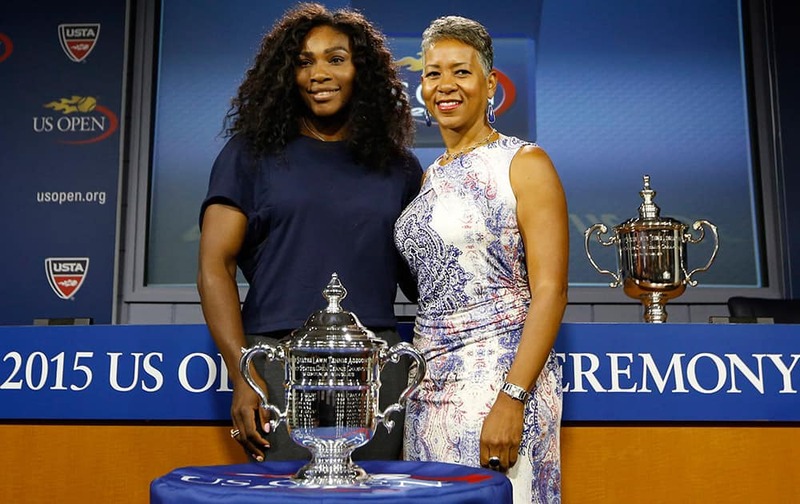 Defending US Open Tennis women's singles champion Serena Williams of the United States, poses with USTA president Katrina Adams and the women's singles trophy following a news conference and the US Open draw ceremony at the USTA Billie Jean King National Tennis Center in New York. 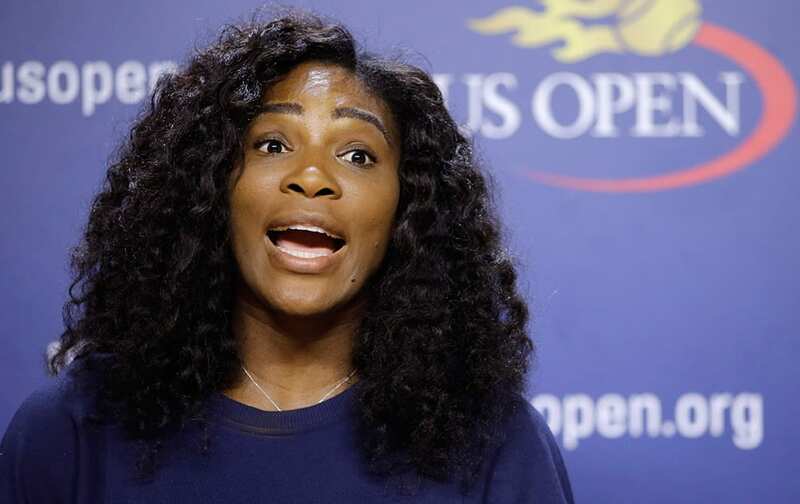 US Open tennis defending champion Serena Williams speaks during a press conference at the USTA Billie Jean King National Tennis Center in New York. 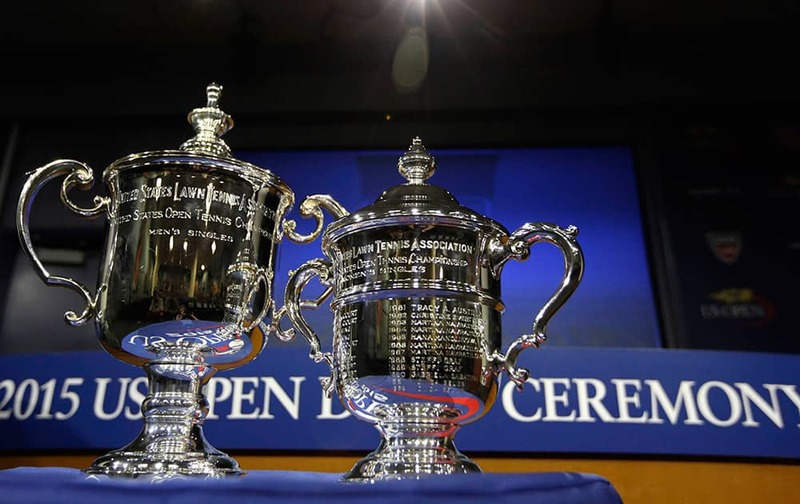 The US Open mens's and women's singles tennis trophies are displayed before the US Open Draw Ceremony at the USTA Billie Jean King National Tennis Center in New York.